This strange episode is full of drama, mystery and tragedy. 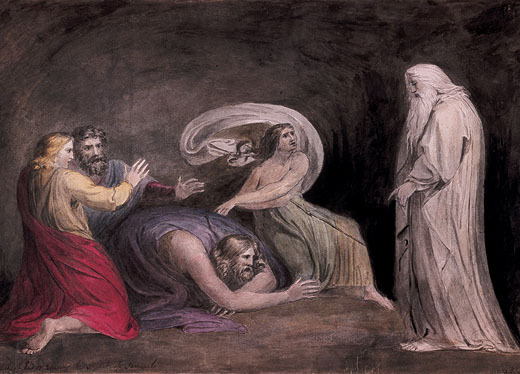 Perhaps Saul’s story was in Shakespeare’s mind when he let Macbeth fall under the influence of the witches. Saul is disheartened by the threat of the Philistines, who are mustering their forces for war against Israel. Samuel has died and Saul is no longer able to obtain prophetic counsel regarding the inevitable military engagement. More than that he has lost a father figure, however harsh and critical that father figure may have been. Saul is pious in his observance of Torah and has banished witchcraft from the land, in obedience to Exodus 22:18, Leviticus 19:3, Leviticus 20:6 and Leviticus 20:27. You shall not permit a sorceress to live.Give no regard to mediums and familiar spirits; do not seek after them, to be defiled by them: I am the Lord your God. The person who turns to mediums and familiar spirits, to prostitute himself with them, I will set My face against that person and cut him off from his people. A man or a woman who is a medium, or who has familiar spirits, shall surely be put to death; they shall stone them with stones. Their blood shall be upon them. However, Saul now seeks a sorceress, because God does not answer him through the legitimate means of prophecy – dreams, Urim and Tummim and prophets. Unlike David, Saul has no dialogue with God. David is in continual conversation with God, in his Psalms and also in his supplications; it is as if God accompanies David in his daily affairs. Saul never addresses God in this way, and reaches out to God only by using Samuel as an intermediary, even using the expression ‘Your God’ when he speaks to Samuel.1 The loss of Samuel is therefore all the more devastating for Saul, as the lines of communication with God are now closed to him. The silence of the Urim and Tummim at Saul’s time of need may be attributed to his massacre of the priests of Nob who had sheltered David; following this violence against the priesthood, the Urim and Tummin no longer respond to his enquiries. Saul instructs his servants to find him a Baalat Ov – literally, mistress of ghosts. The Mishnah tells us that, although it is against the halakhah to consult a necromancer, the client, unlike the necromancer himself, is not liable to be executed.3 The Baalat Ov therefore potentially has more to lose than the king. Now, Saul sheds his kingly garments for the last time. A midrash says that he divested himself of royalty, reading the sin in vayithappes as a shin, to make the point that, in disguising himself, he made himself free (hofshi) of the kingdom.8 He sets out by night, heading north to Endor in the region of the Jezreel Valley. He is accompanied by two servants, named as Abner and Amasa in Vayyikra Rabbah, where Saul is commended in following the Abrahamic precedent of taking two servants with him.9 Louis Ginzberg in ‘Legends of the Jews’ cites a tradition10 that the witch was Abner’s mother. The woman then asks who is to be summoned and Saul tells her ‘Bring up Samuel.’ What follows is startling – not only because the ghost of Samuel appears, but because the witch screams when she sees him. And she says at once ‘Why did you deceive me, for you are Saul?’ What has happened to make her recognize Saul? When Saul hears that the ghost is wrapped in a cloak, he knows that this is Samuel and bows down on the ground. Samuel’s opening words, expressing characteristic displeasure, are the only biblical instance of speech from beyond th grave. ‘Why have you disturbed me?’ is an understated translation of lamah hirgaztani, ‘Why have you caused me to shake?’ The midrashic rabbis attributed Samuel’s shaking to a fear that he had been roused for the day of judgment, noting that even the holy man and seer, Samuel, regards divine judgment with fear and trembling. Saul immediately tells Samuel of his problems: the battling Philistines, the estrangement of God and the silence of prophecy. As in Samuel’s lifetime, he relies on Samuel, however curmudgeonly to be his mentor. He does not refer to the Urim and Thummim; their priestly connotation may remind Samuel of Saul’s massacre of the priests at Nob. tells Saul that God has torn the kingdom away from him (a repetition of Samuel’s words in 1 Samuel 15:28) and given it to his adversary, David. Brutally explicit, Samuel drives home the point that this is all Saul’s fault, due to his disobedience over the herem against the Amalekites. Worse still, he prophesies defeat in the forthcoming battle in which Saul and his sons will be slain. The seer who brought royalty to Saul now tells him of his impending death. The witch now shows a kindly, maternal side and begs Saul to eat. When he refuses, she and his two servants insist until he gets up from the ground and sits on the bed. She then makes him a dinner of veal and flatbread which he and his servants eat, before departing in the darkness of the night. The midrash therefore links the narrative of the witch of Endor to the exegesis of the opening verse of Emor.